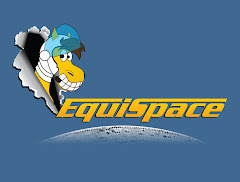 EquiSpace: Win and You're In, eh? Win and You're In, eh? We took a little break from the racing world after Saratoga wrapped up its 144th campaign for a little football and family time. It's good to refresh and reload after a couple weeks away. Of course, we had an eye on what was going on, but just one of them. 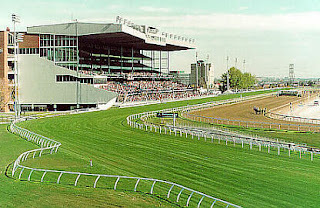 This weekend, the racing scene shifts to the Great White North and Toronto (technically Rexdale) for three (3) Win and You're In turf races to be held at Woodbine Racetrack that will qualify the winners for the 2012 Breeders' Cup to be held at Santa Anita Park outside of Los Angeles on Nov. 2-3. Let's take a peek at the three WaYI races at Woodbine, starting with the 2-year-old races on Saturday that will vault the winners of the Natalma Stakes to the Juvenile Fillies Turf race and the winner of the Summer Stakes presented by TVG to the Juvenile Turf race. The $250,000 Grade 2 Natalma Stakes will pit 13 two year old fillies running a mile on the Woodbine turf course. The morning line favorite is Tiz Ro (3-1) to be ridden by Luis Contreras and will be his first ever turf race after breaking her maiden on the Woodbine polytrack. The Hard Spun filly won impressively by 5 1/2-lengths at the end of July earning a 77 Beyer Speed Figure (BSF). Todd Pletcher ships in Coconut Shrimp (4-1) who earned a 72 BSF at Saratoga in August and top turf rider Javier Castellano flies in to ride the Giant's Causeway filly. She appears to be the one to beat. Bona Venture Stables ships in Summer of Fun (10-1) to run in the Natalma, who broke her maiden her first on turf at the Spa going 8 1/2-furlongs on the Travers undercard. I wrote about her today in the Sports, Ink blog in my Friday column after talking to the connections last night. I give her a good chance to compete in here based on her 76 BSF and the fact that she's won at the longer distance and was over two lengths ahead at the mile mark. The second WaYI stakes on Saturday is the $250,000 Grade 2 Summer Stakes presented by TVG that will also be run over a mile distance on the weeds with a field of eight colts and geldings. The morning line favorite is Archer Hill (5-2) who won at Saratoga for trainer Lisa Lewis. The Big Brown colt out of a Grand Slam mare was pulling away after taking the lead down the stretch going 8 1/2-furlongs in the beginning of August. Lewis is 26 percent after winning her last start with an ROI of $4.33 (impressive). I think The Be's and E's (6-1) will part of the early speed based on her maiden win at Belmont and if he doesn't get hooked in a speed duel, he could steal it on the front end. Garret Gomez, who is a talented turf jockey flies in from California to ride for trainer Wesley Ward. I also give Indiano Jones (4-1) a shot after an impressive maiden win on the Woodbine turf. Sunday's Woodbine card features four graded stakes races, but for some reason they aren't together on the card and will be run as races 5, 7, 9 and 10. This makes no sense to me why they wouldn't put the four races consecutively and have an all-graded stakes guaranteed Pick-4. This happened closing weekend at Saratoga when the Baruch was placed outside the Late Pick-4 on Woodward day. I guess they want to make it tougher and spread the stakes races out. The late Pick-4 doesn't even start with Race 7, that would include at least three of the graded stakes, as it starts with Race 8 and includes two allowance races (8 and 11). The big one is the Ricoh Woodbine Mile, and it has attracted one of North America's best runners in Wise Dan, who comes off a 5-length victory in the one mile G2 Fourstardave at Saratoga on national television in August. He should be a very short-priced favorite by the time the Mile rolls around at 5:42 p.m. ET on Sunday afternoon. The winner gets an automatic berth in the Breeders' Cup Mile. On paper it doesn't appear that any horse in the field can challenge Wise Dan, but if I had to select another horse that has a chance to pull the upset it would be Cityscape (GB), a 6-year-old Euro invader that has faced some top notch competition (including Goldikova) and has won over $4.2 million in his career (over $1.1M at the mile distance). Hunters Bay has been working lights out, but is trying the turf for the first time for Reade Baker. He's fast enough to have a chance and should love the mile distance. Unfortunately we won't be making the trek up this weekend, but we'll be watching the big stakes races to see who qualifies to head to California in November.